3...2...1...Happy year two New Year worksheets! Celebrate the biggest party of the year with these printables that feature coloring pages, DIY masks, and fill-in-the-blank New Year's resolutions. You may even find some printable confetti for when the clock strikes midnight. Count down to midnight with all of our New Years worksheetsAnd have a safe and healthy new year! 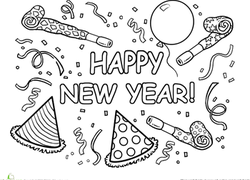 Greet your child with this celebratory Happy New Year coloring page. This printable will get her all ready for the festivities to come! This paper fireworks craft is a great way to let kids on the usually adults-only fun of New Year's Eve. Celebrate New Year's Eve with your own home-made confetti! Little ones can have a blast clipping, and tossing, these colorful confetti to ring in the new year.